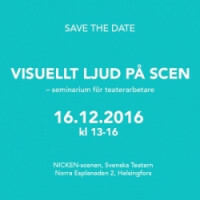 In December, the bilingual play Näktergalen will be performed at Svenska Teatern. The play is performed in Finland-Swedish Sign Language and in Swedish. In connection to the play, a seminar will be arranged for the theatre professionals. The seminar is about how it was to work in a bilingual theatre working group, what kind of artistic and technical solutions were developed, what was the process like? A detailed seminar program will be published soon. The languages of the seminar are Finland-Swedish Sign Language and Swedish.